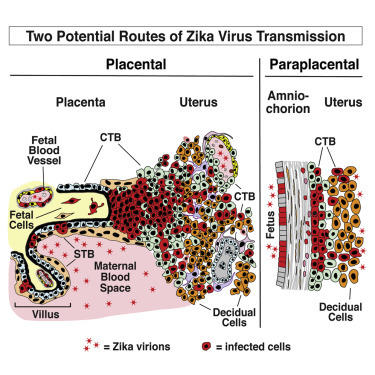 Zika virus (ZIKV) infection during pregnancy is linked to severe birth defects, but mother-to-fetus transmission routes are unknown. We infected different primary cell types from mid- and late-gestation placentas and explants from first-trimester chorionic villi with the prototype Ugandan and a recently isolated Nicaraguan ZIKV strain. ZIKV infects primary human placental cells and explants—cytotrophoblasts, endothelial cells, fibroblasts, and Hofbauer cells in chorionic villi and amniotic epithelial cells and trophoblast progenitors in amniochorionic membranes—that express Axl, Tyro3, and/or TIM1 viral entry cofactors. ZIKV produced NS3 and E proteins and generated higher viral titers in amniotic epithelial cells from mid-gestation compared to late-gestation placentas. Duramycin, a peptide that binds phosphatidylethanolamine in enveloped virions and precludes TIM1 binding, reduced ZIKV infection in placental cells and explants. Our results suggest that ZIKV spreads from basal and parietal decidua to chorionic villi and amniochorionic membranes and that targeting TIM1 could suppress infection at the uterine-placental interface.